Following the launch of its Design lab, Co-creation Hub (CcHub) has opened applications to her design fellowship. The CcHub Design Fellowship has been designed as a 6-month paid immersive programme starting July 2019 for recent graduates based in Rwanda or Nigeria. The Design Fellowship is CcHub's attempt to further improve the economic prosperity in Africa through design-inspired innovations. To do this, they set out to collaborate with domain experts, organisations and the community. The Fellowship will feature courses and projects aimed at incorporating Human-Centered Design (HCD) approaches into how public agencies and corporates solve problems using technology. Participants will spend time in between the new state-of-the-art lab in Kigali—Rwanda, communities and the offices of partner organisations to work on real-life projects and programmes aimed at influencing better outcomes. Intending participants must be proficient in English and younger than 31 years old to be eligible. However, prior experience in Human-Centered Design (HCD) is not a necessary requirement, as graduates of any discipline are encouraged to apply. CcHub's design fellowship might be the first tech fellowship focused on design(ers). Prior, global engineering company—Andela—made Software Development Fellowships more mainstream on the continent via their Andela Fellowship cycle which has now seen over 100,000 applicants. Now more options abound for African youths, with a chance for specialisation in the Design track of CcHub. Interestingly, Andela has a hub in Kigali, so fellows from both organisations can network with each other. By becoming a leading creative space with a multidisciplinary team of product designers and engineers collaborating with scientists and stakeholders globally, the Design Lab is exploring the application of emerging technologies that will solve Africa’s systemic problems. 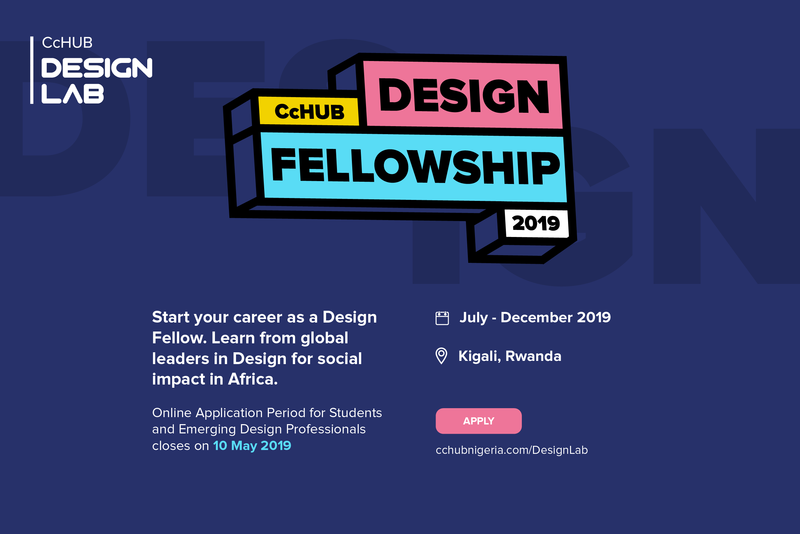 Applications for the CcHub Design Fellowship 2019 in Kigali will close next month—May 10, 2019. Potential applicants can find all criteria and apply on their website.